Story matters a helluva lot in War. Writer-director Matt Reeves returns to the saga after Dawn, and while his vision has certainly gotten more ambitious this time around, he – along with co-writer Mark Bomback – never loses sight of what has driven the films so far: the characters. Taking place two years after the events of Dawn, the film handily places us back into this world and reacquaints us with the mind of chimpanzee and ape leader Caesar (Andy Serkis), whom the war has taken a great toll on. His arc in this film is tremendous to behold, and his roller coaster of emotions complements the film’s engrossing themes of leadership and survival. Even the supporting characters around him, like orangutan Maurice (Karin Konoval) and fellow chimpanzee Rocket (Terry Notary), are compelling in their own ways and illustrate Caesar’s personality as well as his inner conflict. Reeves is adept at world-building, as he not only takes his simian characters into new backdrops like golden beaches and snow-covered mountains, but also reveals how much humanity, manifested in the Colonel (Woody Harrelson), can regress with his human characters. The film can be described as Apocalypse Now meets The Great Escape meets the Exodus story, and while this does mean that the story has plenty to juggle, these elements come together quite well, providing an entertaining and contemplative experience. However, the film does lack narrative tightness. The human characters make some unbelievably stupid decisions that you would neither expect nor tolerate in a military environment, the film gets tonally jarring when it uses the character of Bad Ape (Steve Zahn) for humor, and several plot beats are predictable. The whole cast is on their A game here. Say what you will about whether motion-capture performances owe more to the actors or the technology, but one thing is for sure: it’s impossible for the ape characters to be as compelling and deserving of our empathy as they are without the actors. From the movements and the facial expressions to the emotions being evoked, everything the actors do translates to the characters we see on screen. For the third time in a row, Serkis knocks his role out of the park, but this time around, Caesar’s presence is much more keenly felt because the actor skillfully conveys the toll that his actions and observations take on his soul. The same goes for Konoval, Notary, Zahn, and many others as well, as their commitment to the roles is evident in their characters. Harrelson oozes calm and steely resolve as the Kurtz-like Colonel, and he absolutely nails the character’s emotional complexity and range. Playing the orphan girl Nova, Amiah Miller communicates so much with her face and body language, which is nothing short of impressive considering that she never utters a single word over the course of the film. The filmmaking craft really is something to marvel at. The simians are a towering achievement and demonstrate the sheer power that can be realized in visual effects. Their movements are so natural, and their bodies are textured incredibly well, as seen in the way that water and snow delicately cling to their individual strands of fur. 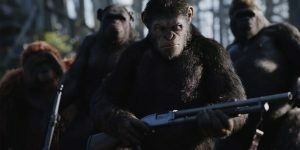 Weta Digital, which has worked on the CG and the motion-capture for all three Apes films, has continued to build upon the apes they first brought to life in Rise, and they may well have reached their peak with this film. Take a look at Caesar’s face, and you’ll really see the contours and details that they replicated from Serkis’ face. This is stellar CG work, and the results are made even more astounding when the apes move and express emotions. Reeves understands this, hence there being so many shots in the film that either focus on the apes’ faces or feature them in extreme close-ups. Michael Seresin’s cinematography is superb, particularly when he captures action. When we’re up close in combat, his camera never shakes, and when he wants to emphasize the scale of the battle, his shot selections – such as an overhead shot slowly moving across a skirmish in the opening scenes – do so deftly. Turning in what could be his best work is composer Michael Giacchino, whose evocative and pensive score aptly matches the highs and lows of Caesar’s journey. A thrill ride from beginning to end, War for the Planet of the Apes caps off one of the better movie trilogies to have come out in recent memory. Complex, entertaining, and emotionally rich all at the same time, this is a summer blockbuster done right.